Click on the image to the right to download your copy of the How to Learn a Track… Fast! eBook. NOTE: Once you download it, please save it to your computer, tablet or smartphone. The database keeps track of it and doesn’t allow you to download it a second time (it’s part of the anti-spam and copyright rules). I love to share what I’ve learned, and lot of it is free (like this eBook). The only thing I ask is that you agree (by downloading the eBook) to NOT share your copy with anyone else without my written permission (note the copyright message in the eBook). If you know others who would like a copy, have them do just as you’re doing, and download their own free copy. And don’t worry, I will never share your contact information with anyone else. 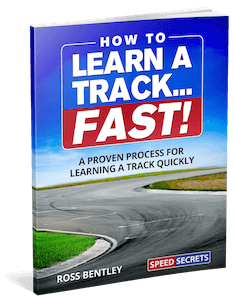 The only reason for having you sign up to download How to Learn a Track… Fast! is so I might be able to connect with you and get feedback in the future, as well as let you know when I release another ebook, video, or whatever. By the way, if you’re interested in driving – and of course, you are – check out the rest of Speed Secrets.com. You’ll find a ton of tips and resources there, including other free (and some you-pay-for) eBooks. Keep learning and have fun!